This morning we had my mom’s special egg masala curry with Appam. I will share the recipe for the same here. Grind the garlic into a paste in a mixer. Add coconut oil to the pan and add sliced onion, green chillies and saute till onion become brownish. Add tomato, garlic paste (#1), curry leaves to the pan and cook till tomatoes become soft. Add the masala’s to the pan and saute. (if needed, coconut oil can be added). Drop the eggs into the pan and mix it well with the mixture. Cover the lid for 5 minutes in a low flame. Add water, salt, garam masala and cover it with the lid. Serve hot with appam, idiyappam, porotta or pathiri. Use low flame for #4. It will prevent masala from getting burned. If you need more spicy, add chilly powder and garam masala. You can even add it in step #7. Want to learn more egg recipes? check these. 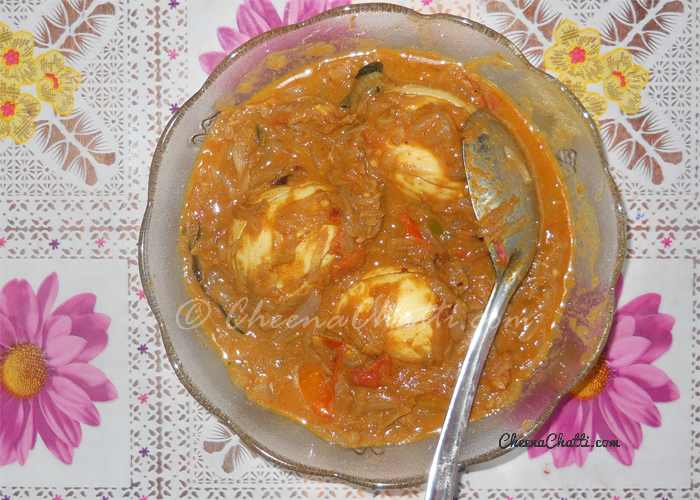 This entry was added on February 26th, 2013 by Renoos in Gravies and Curries and tagged with egg curry, indian egg curry, kerala egg curry recipe, egg curry kerala, egg, egg masala curry, curry, kerala style egg curry, how to make egg masala. Last revised on March 27th, 2018.
simple easy and nice receipe Reenoos. Thank you for stopping by and trying the recipe Reena. just made this, used less onion, little less green chili, and added some tomato paste. Came out pretty well. Thanks for the recipe! Really nice…very simple n tasty.. Thanks for trying and sharing your feedback 🙂 Don’t forget to try our other recipes too..
A quickie…. helpful for self-cookers like me!